Marcos Rojo, who made his fifth Premier League appearance of the season against Burnley, is, to his credit, suspended after his fifth yellow card of the season. 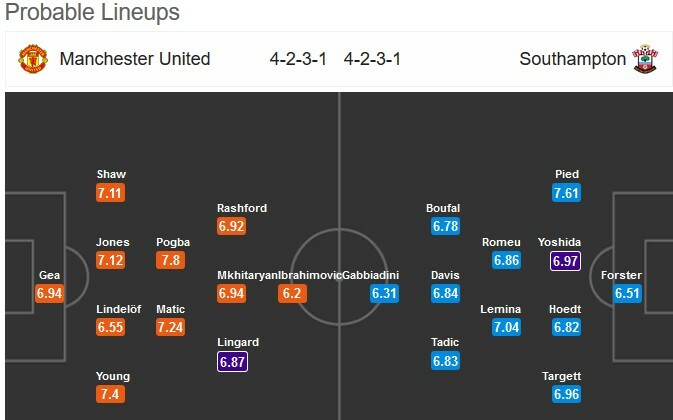 Victor Lindelof should deputise alongside Phil Jones, with Chris Smalling and Eric Bailly ruled out, while Luke Shaw may also feature again due to Matteo Darmian and Antonio Valencia’s respective injury issues. Anthony Martial is a doubt for the hosts, while Marouane Fellaini and Michael Carrick are ruled out. Jose Mourinho could make a couple of changes to his XI here, with Jesse Lingard expected to start, while Zlatan Ibrahimovic and Henrikh Mkhitaryan may feature here. Charlie Austin, Cedric Soares and Ryan Bertrand are all sidelined for Southampton. Man Utdareundefeated in 26 of their last 27 home matches (Premier League). There have been over 2.5 goals scored in 6 of Man Utd‘s last 7 games (Premier League). Southamptonhavefailed to win their last 7 away matches (Premier League). Man Utdhavescored at least 2 goals in their last 3 matches (Premier League). Manchester United were made to come from behind to secure a late point against Burnley on Boxing Day and have since fallen further behind Manchester City in the title race. A 5-2 loss to Tottenham means Southampton have now failed to win in seven Premier League outings, which has seen them drop just two points above the relegation zone. United have lost only one of their last 27 home league matches, so Saints’ task to return to winning ways doesn’t get much easier here. While United have underwhelmed of late, the hosts should win this one. This entry was posted on Thursday, December 28th, 2017 at 4:40 pm	and is filed under Match Preview. You can follow any responses to this entry through the RSS 2.0 feed. You can leave a response, or trackback from your own site.